Good manners demonstrate that the child understands respect. When a child says “please” and “thank you” they are exhibiting manners. But not interrupting two adults while they’re talking is also a sign of respect and good manners. It demonstrates the child knows enough to wait to ask a question and is often a result of parents properly training their child. What are some other ways a child can show basic manner skills? * They can say greet people when they meet them. * They can look people in the eyes when being spoken to. * They can let guests go first, whether on the playground or waiting in line for dinner. * They can avoid being late. This shows the other person you respect them and value their time. * They can share what they have with others. * They can help people if they are able. Children who use their manners are also more likeable than those who are rude. This may not be a motivating factor when the children are very young, but as they get older it may be. Children want to be liked as much as any teen or adult; as they get older they will learn that using good manners will leave a positive impression. Using their manners will also show their peers how to act and may teach their friends to be polite as well. If you want your child to be polite and use good manners, you may have to ask yourself if you use them yourself. Since children learn by watching others, it’s important for them to hear you use polite conversation and treating others with respect. When they see you “practice what you preach” they will be more likely to follow your lead. Why don’t children have good manners as much anymore? Part of the problem is that society doesn’t require it as much as in the past. Watch television or movies today and you’ll see children being disrespectful and ill-mannered to their parents, their peers, and people in authority. If children are allowed to watch this type of entertainment, it is not surprising when they act accordingly. We need to remind our children that how we treat others is most often the way we will be treated in return. If we want to have friends, we have to be friendly. If we want to be treated kindly, we have to treat others kindly. If we want people to take our feelings into consideration, we have to do the same for them. Unfortunately, your child may have to start the trend by doing the things they would like others to do for them, but they can have a great influence on the children and adults around them. Teaching your children good manners isn’t hard. They can learn by watching us, as adults and parents, use good manners and treat others with respect. When you know why good manners in children are important, it makes taking the time to teach and train them something you look forward to doing, to see them reap the benefits. I was just watching a show on budgeting. I had to chuckle when watching it because the woman on the show was going into great detail about making charts, tracking your spending and savings and lots more. Even I, who have a good grip on my spending, was getting overwhelmed with all the things said a person needed to do to get out of debt. She then used one of my favorites, which is to keep track of every penny you spend. You know, the “Carry a small notebook in your car and write down every penny you spend” method. I know this works for some people and please keep using it if it’s working for you, but I often wonder if these people live real lives or have actually ever really tried their own suggestions. Let me give you my own personal experience with the little notebook. I have a notebook in the car all nice and handy. I load 5 of my 6 grandkids into the car and we are heading to their house. On the way, I run into the store. I have things I need to return and then things I need to buy. Two of the grandkids want to buy something with their own money but one is $.75 short and another $.35 short, so they ask to borrow it from me and promise to pay me back when we get home. On the way out of the store, we walk past the bubble gum machines and so, of course, being a proper “Nana”, I start passing out the quarters for gum. Two of the quarters disappear into a machine that fails to spit out the gum, so I have to find two more quarters and calm the two distraught children. Finally, we make it out the door and head for the car. I quickly make sure each child is holding someone’s hand so they won’t get flattened crossing the parking lot. It’s a frantic journey to the car as kids drop their new gum, leftover change and a package or two along the way. Then we all climb in the car and wrestle with car seats, seat belts and, most importantly, who gets to sit where and by whom. Yes, the car is hot and everybody’s tired, but despite that I say, “Just a minute– I have to write down what I just spent.” Suddenly, we are looking for the little notebook; on the floor, in the seat, on the dashboard. At last, we find it, stuck in between the seats under the youngest child’s car seat. After tugging and pulling, pushing and shoving, buckling and unbuckling, we have the notebook. Now where is that pencil? Ah, easy find. It’s under the trash can on the floor. These methods might work well for some people, but my life is complicated enough without adding more. At times, my whole day is like the above story, so I have so many more important ways to spend my time than constantly searching for a notebook or writing on a chart. What does a person do? I once worked for a man who had a major problem controlling his spending. Here’s what finally helped him: Every Monday morning he put a $20 bill in his wallet. That twenty was all the money he allowed himself to spend for the whole week. It was his lunch money, pop money and, if he saw something at a store he really wanted, he had to buy it with his twenty or do without it. This made him go home and think about the thing he wanted. Did really need it? Was it really worth it? Half the time, just having to drive back to the store was enough to deter him from buying it. He even found himself making a game of it challenging himself to see how much of the twenty he could still have left at the end of the week. He started saving the extra money to use for something bigger and more special that he wanted. Often, after he had a nice chunk added up, he decided to just apply it to a bill. Watching that bill slowly go down told him he was winning the game. If you have tried other ways unsuccessfully, you might try the twenty dollar bill idea. –Oh, and it doesn’t have to be a twenty. Depending on your circumstances and where you live, it could be more or less, but pick an amount and stick to it. It may take a week or two to figure out how much you want to allow yourself but, after that, use a set amount and that amount only for your miscellaneous spending money. With this system, if you spend it all by Wednesday, too bad! You will have to eke by the rest of the week and, if you aren’t already bringing your lunch to work or finding other ways to save, you will find yourself starting to do it just so you can save more of your “twenty”. What I like even better about this idea is, at the end of the week or month, instead of having a huge column of little piddly things to add to your ledger, you only have to make one entry for the twenty for each week. That’s it in a nut shell. We can make charts and write lists but the bottom line is, we simply need to either stop spending or start earning more. Too often, we focus on learning how to get out of debt with the misconception that, simply by learning, we are doing something about our problem rather than focusing on getting out of debt by actually stopping our spending. Often, we want to know how to save on the large amount of groceries we buy, never thinking that we could save a lot simply by not buying so much. Or, here’s one that I love: “My husband lost his job, so how do I save on our vacation?” I don’t know how to say this gently but, if you don’t have a job or you had a pay cut and don’t have enough money, you don’t take a vacation, play golf, buy new things to fix the house, put your kids in sports, throw expensive birthday parties, keep buying junk food or convince yourself that you really need to keep your cable and Internet to help you find a job. There is one way and one way only to get out of debt and that is to spend a lot less than you make. The more desperate your situation, the more drastically you have to reduce your spending. Some of you may have to go from having your hair, nails and toes done once a month to only having your hair done. If things are really tight, maybe you can’t pay to have anything done most of the time. You may have to learn to share only one car. You might have to start walking or taking the bus. Whatever you need to do to pa it off, get serious and do it. Key words for today’s lesson. Stop spending or start earning more. We recently lost our beloved cat, Scamper. We still miss him terribly and it was very hard on the kids as they became so attached to him like a fellow family member. As adults, we know that animals won’t live forever. Children often don’t understand this and it can come as a shock to them when a beloved pet passes away. Here are ways to help your child cope when a pet dies. Most children consider pets to be members of the family. Perhaps you had your dog or cat before your child was born and your child was raised with it always being there. They have given your child unconditional love and they will be missed. * Allow your child the opportunity to cry as much as needed. This may be your child’s first brush with death; giving them the freedom to grieve will help them process the death and deal with other deaths in the future. * The death of a pet may bring up thoughts about people dying, including you and them. If your family has a particular belief system about life after death, you’ll want to use this time to explain your beliefs. * Let your child ask questions and try to respond to them on their level. Be honest with them when answering questions. The important thing is to comfort and explain in a way they’ll understand. * Keep explanations short. Pay attention to their body language and stop if they seem tired. Let them take a break and come back when they’re ready for you to answer more questions. * Be honest about the pet’s death. Tell them what death means – that the heart stopped beating – and the pet won’t be coming back. Avoid saying you had the pet “put to sleep” because it may make your child afraid to go to sleep. * If you have to euthanize a pet, involve the child in the decision. Tell them the vet will give them a shot which will stop their heart and they will peacefully die. It may be easier on your child if they aren’t present, but that decision is up to you and the vet. * Be sure your child knows the death of the pet isn’t their fault. They need to understand their pet’s death wasn’t due to their being “bad” or because they didn’t take care of the pet better. * Expect emotions like shock, disbelief, denial, insecurity, loneliness, anger, and guilt. These are universal feelings people share whether they’ve lost a person or a pet they’ve loved. * Accept your child’s feelings and respond with compassion. Children need to express their feelings, and know they are safe doing so, if they are going to process their grief in a healthy way. * Give your child a chance to say good-bye. If you can’t bury the pet at home, you can still make a place where your child can go to remember them. * Don’t rush to replace the pet. Give your child a chance to grieve before buying another pet. When it is time, let them help find and choose a new pet. The local Humane Society or animal shelter would be a good place to start your search. Help your child remember the pet with love and gratitude for the special bond they shared. Losing a pet can be a traumatic event, especially for younger children. By using some of these ways to help your child cope when a pet dies, it may make the journey to healing a little easier for both of you. Wouldn’t we all like to make our kids’ lives magically full of friends and free of stress? Unfortunately, there is no magic formula for making the transition to a new school totally stress-free. But there are things we can do to help kids cope. Teaching them how to make friends can really help children adjust to a new place. Here are some strategies for helping your kids in a new school. If it’s practical, arrange a meeting with your child’s new teacher before the first day of class. Most teachers are glad to do this, and if your child sees a familiar person in his teacher, he will feel more relaxed. See if the prospective teacher will meet you both for lunch, or come to your home for a meal. More than one meeting is even better. Take a tour of the school to get familiar with the layout and possibly meet some of the students. If it’s summer, there may be an official orientation for new students; but it’s better to go as a family or with a parent in a no-pressure visit. Your child will feel a lot less overwhelmed if she knows where her locker, the bathroom, and her classroom are going to be. Your child needs to feel safe in discussing social problems and joys with you. If you and your child never talk about such things, you may think everything is just fine when it is not. Don’t be afraid to ask questions, and let your child know you are asking because you want to help. It’s easy to take these skills for granted, but your child may not know these things – especially if you have never gone over them. Teach him to look people in the eye, to shake hands, to answer when spoken to, and to introduce himself. Also teach specifics about being a good listener, such as not interrupting and making eye contact while another is speaking. These are skills that will serve your child well in school and in the future. You can arrange play dates and meetings to teach these things, and take advantage of ones that happen along the way, such as the grocery checkout clerk or the mailman. Keep it relaxed and easy, even game-like at times, because high-pressure situations forced on your child will only make him more anxious. There’s no need to overwhelm your child with a dozen extracurricular activities. But finding something your child can do with others can help socialization. Find out what groups are available at your child’s school – it does not have to be a sport, or a large, organized group (although those are fine). Find something that suits your child’s personality and needs. Teach and practice socialization, talk to your child about how she’s doing, and the transition to a new school will be more a time of excitement than one of stress. When my children were younger the one thing that saved us was having chore charts. This article talks about the advantages of a similar system. Do you use chore charts and rosters? Would love to hear about your experiences! If your family has several members, it’s quite likely everyone has activities to attend. It’s also a good bet the parents expect the children to help with chores around the house. There are many advantages of family rosters, or charts, to keep your house running smoothly. 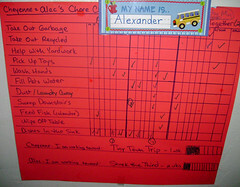 Chore Charts can make daily and weekly chores easier. By making a roster, you’re able to write down all the chores that need to be done and who is responsible for each chore. Then you can create a centralized roster for the whole family or give each person their own roster of chores. Consider having a family meeting to discuss changes being made in regard to chores. Explain that each person, except infants, will be expected to help. You may also want to determine consequences for not doing chores in a timely manner. Some families even go as far as writing up a chores contract that each person is expected to sign, showing they understand their responsibility in helping keep the house running smoothly. Start by knowing what each family member is able to do. Make a list of chores each person can do and then assign each one to the person best able to do them. Of course, if you have several children close in age, you may want to switch out days so they share duties. Continue to assign chores based on ability until all household chores are assigned and rosters made. Don’t expect everyone to do their chores perfectly the first day. In fact, you may want to give yourselves a week to get used to the new family rosters. Once everyone learns what they’re supposed to do and actually does them, your house could begin to run smoother than it ever has. One advantage of having family rosters is the fact that one person won’t be responsible for everything. It wasn’t uncommon in the past for women to “keep the home” while the men cared for everything outside. Times have changed, and traditional roles for caring for the home have changed as well. Another advantage of family rosters is the work should get done quicker. The old proverb “many hands make light work” is true. If everyone is working to get their chores done each day, there won’t be so much work to do on the weekend. This will free everyone up to do things they enjoy rather than tackling chores at home. Perhaps your family hasn’t been successful at keeping a family roster. Put past failures behind you and start afresh. When your family realizes the advantages of family rosters, they may be more willing to give it another try. Before long, your family will know what’s expected of them, do those things, and the house and family will thank you. Another great Lunchtime article! Enjoy! Don’t look now, but school’s here! Are you ready for one of the biggest challenges for Moms of school-age kids – preparing school lunches day after day? You’re already in the kitchen preparing your family’s dinner, why not use that time to get a head-start on the next day’s brown bag lunches? Make a double batch of meals that taste just as good “the morning after,” you know, like fried chicken. Or cook dishes that can be transformed into something “new”, such as pasta sauce that’s just as yummy as pizza topping (on ready-made crust of course). To make meal planning easier, take a look at Dine Without Whine. It’s a monthly service for planning your family’s meals and grocery shopping. To do tip #1, you need to be more organized. This means including your kids’ lunches when planning your family dinners. Lighten your load and teach your children some important life skills at the same time. Even small children can help prepare their lunches. Do whatever you can do ahead of time. For example, cook in batches on the weekend, or put leftovers in packable containers the night before. Commercial packed lunches are attractive but unhealthy. But who says you can’t make your own? Buy your own colorful and attractive lunch boxes, such as a bento-style lunchbox. Fill it up with a variety of healthy food. Think of mixing up foods with different textures and colors. And cut them up into small pieces so they’re easy and fast to eat. Soup makes a quick and healthy lunch. You can cook a large pot in the weekend and pack it in a thermos for a warm and satisfying lunch. Serve with whole wheat bread and some fresh fruit and you’ve got a complete meal! Sneak a little surprise into your child’s lunchbox once in a while. It could be a little chocolate treat, stickers, or a sweet note from you. Getting something unexpected makes lunch fun. With planning and creativity, your children can have healthy, delicious lunches without too much work for you. For meal planning help, go to Dine Without Whine. It makes meal planning a breeze, while helping you save time and money. Then you’ll have time and energy for those school lunches. We found a great online resource (thanks to Lynette of Blogging Starter Pack) for kids. REI online has a Passport To Adventure page complete with a printable Adventure Journal, interactive map to find family friendly places for bike riding and hiking and prizes for participating. Check it out at REI’s Passport to Adventure page here. Enjoy! Stress is a normal part of life. How we choose to deal with it, however, is an entirely different subject. As a parent or grandparent, it’s important to know how to help your children deal with stress effectively. Today it’s unusual to see a child simply relaxing and playing. There are expectations from family, teachers, and friends, as well as technology and activities to keep them busy. Some studies suggest a third of all children suffer from undue stress. In fact, even young children are beginning to show signs of chronic stress in ever-increasing numbers, enough to concern health professionals. Listen to the child in your life and learn to recognize the symptoms of being overly stressed. They may act out, whine incessantly, or try to isolate themselves if they’re not verbal yet. Older children may show a lack of patience, become stubborn, or have trouble concentrating. They may also express physical symptoms such as headaches, stomach-aches, or lack of energy. Pay attention to the symptoms and try to determine if they’re caused by stress or if they’re simply misbehaving. Teach your child to recognize the difference between being relaxed and being stressed. Explain how stress might make them feel tense or stiff like a piece of wood. Help them learn to relax by tensing their muscles and the letting the tension go. When they can tense and release their muscles at will, they’ll be able to learn to relax more efficiently. Be available for them. Perhaps part of your child’s stress is caused by everyone in the family being too busy. Your child needs to know they can find you if they need you. You might want to reduce the number of activities your family is involved in so you’re more available for them. Take time to spend alone with them if you notice them starting to become apprehensive. Try to be patient with them. The old saying “Rome wasn’t built in a day” can be applied to your child learning to deal with stress as well. Learning to deal with stress takes time and your child needs you to be patient with them while they learn. Have some fun with your child. There is little that can beat laughter for reducing stress in children and in adults. Play games with them, watch silly movies, or just enjoy listening to their goofy jokes. You’ll both feel better and less stressed. It’s important to remember that stress is common to nearly everyone. And while adults have years of experience dealing with stress, that’s not so for the children in their lives. Your child depends on you to help them learn how to deal with stress. This can begin at an early age and continue until they are in their teens. By the time they’re adults and able to better understand stress, they’ll have mastered dealing with it effectively. Children can learn to do household chores at a young age. Even toddlers can be taught to pick up their clothes and toys and put them away. Preschool-aged children should be doing a wider variety of household chores. In our home, I keep my preschoolers’ chore list short and simple, but they have come a long way in learning to clean up after themselves. Not too long ago, I was still helping my four-year-olds get dressed in the morning. That was one of the first tasks to be put on their chore chart! I thought if I made it a “chore”, and that if doing chores would earn them a special reward, then they would be more motivated to get themselves dressed in the morning, and I was right. Another chore I have my preschoolers do is put their dishes in the sink after they eat, including scraping their plates into the garbage can first. The first couple of times I had to remind them to do it after they ate, but very quickly it became a new habit for them and they started doing it without even thinking about it. Young children have a way of making your home look like a tornado tore through it. Picking up all their toys day after day gets really tiring, and some days I just want to give up. I don’t make my boys pick up every single toy laying around the house, but every afternoon I have them do a general cleanup to get most of their toys put away where they belong. If you label containers for them, this exercise is also a great way for teaching them simple words as they look for the correct container to put away their toys. At night time my boys put on their own pajamas and brush their own teeth. There are many rinses available that make brushing teeth fun for kids… who wouldn’t want their teeth to turn blue!? My boys look forward to brushing their teeth every night. Every night before bed my boys get to choose a small toy from a “treasure” box I put together to reward them for doing their chores. This box is full of small plastic lizards, frogs, stickers, temporary tattoos, and other small toys. You would think a child wouldn’t go to all that trouble just for a small temporary tattoo, but you would be surprised. The novelty still hasn’t worn off for my kids, even after several months. They really look forward to picking out their treasure every night. My main goal in choosing these simple chores for my children was to have them start doing the things for themselves that I do for them day after day. It frees up more of my time for other household chores, and they are learning to take more responsibility for taking care of themselves. Rachel Paxton is a freelance writer and mom who is the author of What’s for Dinner?, an e-cookbook containing more than 250 quick easy dinner ideas. For more recipes, organizing tips, home decorating, crafts, holiday hints, and more, visit Creative Homemaking.com.